Fancy getting your hook into something new? 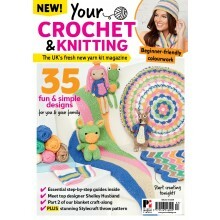 Then say hello to the UK’s freshest crochet magazine! 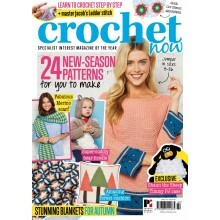 Every issue of Crochet Now comes packed full of stylish, beautiful and cute patterns, with the best expert advice and step-by-step tutorials to help you make the most of your next project. Alongside the latest yarn, leading crochet designers and these fabulous patterns, you’ll also receive an EXCLUSIVE gift with every issue! Are you ready to learn something new? This month we’re bringing you a fantastic collection of inspiriting Tunisian Crochet patterns, along with your new favourite crochet hook! Crochet scarves, blankets, and makes for the home, like our Official Sooty Cushion! 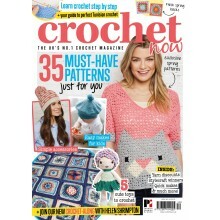 As ever, the brand-new issue of Crochet Now is full of inspiring patterns (from toys to garments and everything in between) for all levels, step-by-step guide, fascinating reads, and now don’t miss part one of our new crochet-along from Stylecraft Blogstar Helen Shrimpton (Crystals and Crochet). De-clutter your yarn stash this spring with our spring-cleaning special, including 31 inspiring crochet patterns to help you use up your stash! Find gift ideas for Mother’s Day, Easter and just for you inside. Be sure to read our expert guide on stash-busting and pairing colours to create beautiful blankets, and how mindful crochet can help you improve your well-being. Plus use your all-in-one Crochet Card Kit to create fun cards for someone special, and UK readers are going to love their Mr. Messy cushion pattern! 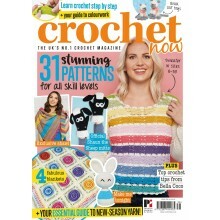 This month Crochet Now is packed full of sugary goodness with our candy-inspired collection. Fill your wardrobe and home with pretty pastels, beautiful bold colours, and more with our collection of 31 unmissable patterns for you and your home. We’re also excited to present this issue with an exclusive collection of Shaun the Sheep crochet tools, including stitch markers, notions case, and more, and get hooked on our official pattern for a pair of Shaun the Sheep mitts – perfect for adults and children! Brighten up your winter with the brand-new issue of Crochet Now – issue 37 is packed full of exclusive patterns from your favourite designers, and our Animal Lovers collection is so much fun. Don’t miss our star kimono-style cardigan and amazing C2C designs, plus we’re bringing you an official crochet kit from the RSPB! Join in the Big Garden Birdwatch this month and hook up these charming birds while you spot them, and many more, in your own back garden. 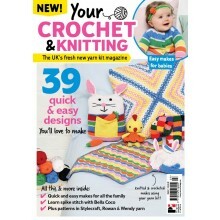 Our fifth issue of new magazine Your Crochet and Knitting brings you quick and easy knitting and crochet projects, which can be made using the yarn kit or from our suggested alternative branded yarn. Your yarn kit includes eight gorgeous colours, perfect for making ombré-style projects , knitting needles and a crochet hook. Plus bonus three toggles ready for fastening your little one’s brand-new cardigan. We bring you essential and exclusive makes for you, your home or for your little ones, including our official crocheted and knitted Paddington toys. The magazine features simple makes and basic guides for crocheting and knitting, ideal for the beginner or return crafter. Sarah-Jayne Fragola from Bella Coco Crochet shows us her tips for making the perfect Paddington coat in her step-by-step tutorial, which is great for perfecting the basics of crochet. 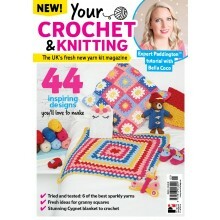 Find out all about Emma Escott’s adventures in this issue’s Your Crochet and Knitting Story. 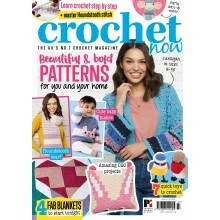 Our fourth issue of the UK’s favourite new craft magazine Your Crochet and Knitting brings you quick and easy projects to crochet and knit with your bumper yarn pack. Your yarn kit includes 8 vibrant colours perfect for a thoroughly modern Christmas, as well as knitting needles and a crochet hook, plus a bonus toy-making pencil for making blushing cheeks and winter red noses on your toys. 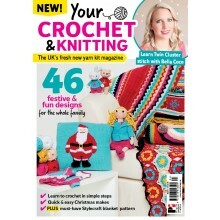 This issue is packed with fun and festive makes for you, your home and for your little ones, including our official Raymond Briggs Father Christmas knitted cushion and crocheted toy. Christmas is the most magical time of the year, so this month we’re bring you a collection of 29 festive patterns as well as some makes inspired by the beauty of nature to encourage you to get hooking! 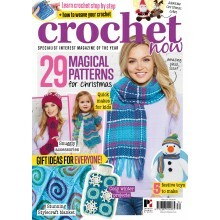 Included with issue 34 is our Christmas crochet collection with TOFT, full of luxurious accessories and fun toys to make. And don’t miss our official Raymond Briggs’ Father Christmas pattern! 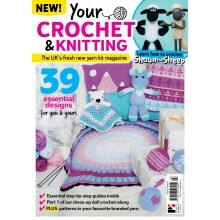 The third issue of exciting new magazine Your Crochet and Knitting brings you a huge range of projects in both crochet and knitting to make with your bumper 8-ball yarn pack. Every single one of our original patterns can be made using the yarn and tools in your kit. We bring you fun and simple makes for you, your home or for your little ones, including our official crocheted and knitted Shaun the Sheep toys. You’ll also find an adorable knitted baby cardigan, crocheted and knitted cushions as well as festive makes to get you in the mood for Christmas. The magazine is also packed with step-by-step guides and top tips, including our editor’s guide to achieving the perfect tension. Sarah-Jayne Fragola from Bella Coco crochet shows us how to make better toys with her Shaun the Sheep tutorial and Mandy O’Sullivan of Redagape tells us how her yarn adventures started. Get ready for the new season with our fab collection of 24 must-have patterns, inspired by the romance of autumnal woodland scenes, with pops of happy bright colours to make your crochet fingers itch. Find patterns for the you, your home and your family inside, including a stunning blanket made in West Yorkshire Spinners, and an Alice in Wonderland inspired Merino scarf using King Cole. 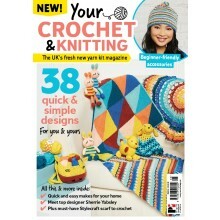 Our second issue of brand new magazine Your Crochet and Knitting brings you exciting projects in both crochet and knit which can be made in your yarn kit or from our suggested alternative branded yarns. Your yarn kit includes 6 beautiful colours ideal for summer, knitting needles and a crochet hook. Plus – stitch markers, toy eyes and a key ring. We feature quick and easy makes for you, your home or for your little ones, including our official Peter Rabbit movie toys in both crochet and knit. Included with the magazine are quick makes, step-by0step guides and suggestions on where to use your kit stitch markers and toy eyes. Sarah-Jayne Fragola from Bella Coco crochet talks us through her ‘little fan’ stitch tutorial and Jane Crowfoot gives her expert advice on how to use colour successfully. Our very first issue of Your Crochet and Knitting brings you exciting projects to knit or crochet with your bumper yarn kit, which includes 6 vibrant shades of yarn, knitting needles and a crochet hook. Plus – a darning needle and black yarn, perfect for adding features to your handmade toys. Your first issue also comes with a bonus pocket-sized Crochet and Knitting in Easy Steps book; ideal to keep in your bag for those on the go projects. Inside the magazine, you’ll find quick and easy makes for you, your home and your little ones, including our official Mr Men and Little Miss toys and jumpers. Throughout the magazine, our team of experts will show you simple techniques to create bright and beautiful projects in no time. You’ll be spoilt for choice but don’t worry – if you want to make multiple projects from the magazine, our kit yarn knits to a standard tension, so you can easily find a perfect substitute in any yarn shop – and we’ve included our recommendations throughout the magazine. Essential Knits 3 is packed with 58 quick-knit patterns, techniques and inspiring ideas for all abilities! Never struggle for summer knits again with Essential Knits 2, full of 62 patterns and ideas for you to try! Crochet Essentials 2 is packed with 53 crochet patterns, techniques and inspiring ideas for all abilities. 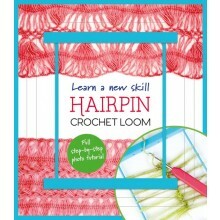 FREE Hairpin Loom Tool & Pattern Booklet! In Crochet Now issue 15, try your hand at a new technique with our free hairpin crochet loom tool – you’ll also get a step by step booklet with pattern inspiration. 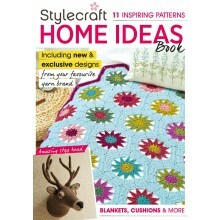 FREE bonus magazine from Stylecraft! 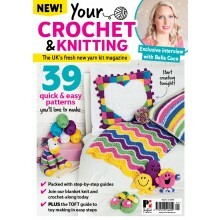 This issue comes with a free bonus magazine from Stylecraft – including 11 patterns for blankets, cushions and more. 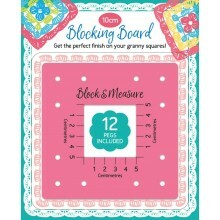 This issue comes with a free 10cm blocking board – perfect for granny squares – and an extra magazine with some block ideas to try out.